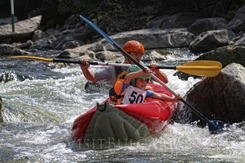 The fifth national fair “Whitewater kayaking 2013” will gather all keen rowers by the Struma river from September 6-8th, 2013. The whitewater kayaking competition will be held on September 7th at the slalom terrain over the Kresna hans. The slalom terrain is already prepared and is opened for training. It is 300 metres long and a third category difficulty, according to the International Categorization.